Although flow cytometry was invented more than 45 years ago, it continues to grow and expand into new areas that marry it with other modern cutting-edge technologies. Harnessing the power of the full spectrum, coupling it with mass spectrometry, and utilizing it for expression profiling are a few of the new and intriguing applications heralding the next generation of flow cytometry. 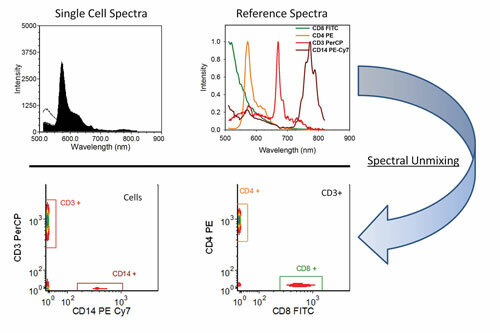 Immunophenotyping using the La Jolla Bioengineering Institute’s approach to spectral flow cytometry: Peripheral blood mononuclear cells were stained with a cocktail of fluorescently labeled antibodies, and the complete emission spectrum of each cell was measured. Singly stained antibody capture beads provide reference spectra for spectral unmixing, which is used to calculate the abundance of each marker on each cell, quantities that can be displayed in familiar histogram plots. Although autofluorescence can be a significant problem in typical flow cytometry, spectral flow easily resolves the issue. “With spectral flow, autofluorescence is just treated as another ‘color’ and can be resolved from other colors using spectral unmixing, effectively reducing a major source of background,” notes Dr. Nolan. Dr. Nolan and colleagues demonstrated proof of principle by using calibrated beads stained with six different quantum dots to demonstrate the analytical performance of the instrument. To evaluate performance in a typical immunophenotyping application, they analyzed peripheral blood mononuclear cells stained with canonical surface markers used to discriminate lymphocyte subsets. A new technology adapts the analytical capabilities of atomic mass spectrometry to address the challenges of multiparametric flow cytometry. Advancing this technology is CyTOF®, a mass cytometry system developed and produced by DVS Sciences. Emulating flow cytometry, this technology involves tagging antibodies with isotopically pure rare-earth metals rather than fluorophores. After incubation with a panel of metal-conjugated antibodies, hundreds of cells per second are passed through an argon plasma that atomizes and ionizes the metal tags that are subsequently analyzed by a time-of-flight mass spectrometer. In a typical cell analysis experiment, the data derived in less than four minutes of raw collection provides analysis of more than 100,000 cells. “The CyTOF system has the capability to measure more than 100 different parameters with negligible signal overlap,” notes Scott Tanner, Ph.D., CTO and co-founder. “Currently, we offer 34 distinct metal tags and continue to develop more,” adds Nicole Ellis-Ovadia, head of marketing. Researchers can label their own antibodies or choose from a catalog of over 200 pre-labeled antibodies or application-specific panel kits. 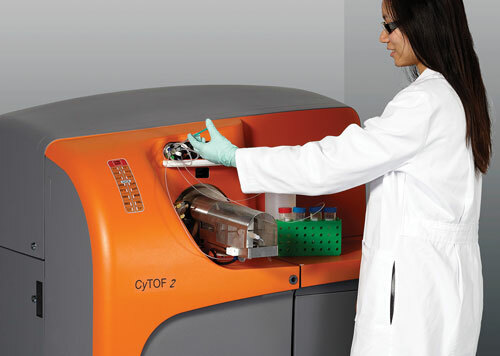 The CyTOF 2, from DVS Sciences, analyzes cells labeled with stable heavy metal isotopes using time-of-flight atomic mass cytometry technology. In the last five years, highly multiplexed, single-cell gene expression studies have revealed a great degree of heterogeneity in cell populations thought to be relatively uniform. However, little work has been done in immunological systems, where heterogeneity is known and expected, according to Mario Roederer, Ph.D., a senior investigator at the NIH. Dr. Roederer’s team performed a series of studies to define the gene signatures and identify the coordinate expression patterns of multiple genes in unique cell subsets. Dr. Roederer’s team utilizes a multicolor, fluorescence-activated, cell-sorting system along with Fluidigm’s BioMark™ system to dissect single-cell gene expression. The latter is performed on 96 samples simultaneously and can measure 96 or more genes in each sample. “Although the technology has been used in several disparate biological settings, methodological details for optimal and quantitative application were lacking,” comments Dr. Roederer. The team examined the activation of CD4+ T cells at the single-cell level and identified subsets in the population. They showed that co-expression of certain gene combinations such as CXCR5/CCL5 and DPP4/TlA1 were actually rare events rather than common occurrences as previously thought when bulk mRNA was investigated. According to Dr. Galbraith, the team is now extending this paradigm to mammalian cells and tissues. By using a promoter-specific regulatory sequence and this particular marker targeted to the nucleus, the team is able to extend their analysis to many different types of cells. Scientists at the BIO5 Institute simultaneously sorted green fluorescent protein (GFP)-positive and GFP-negative nuclei and used microarrays to determine which transcripts were most abundant in the GFP-positive nuclei. 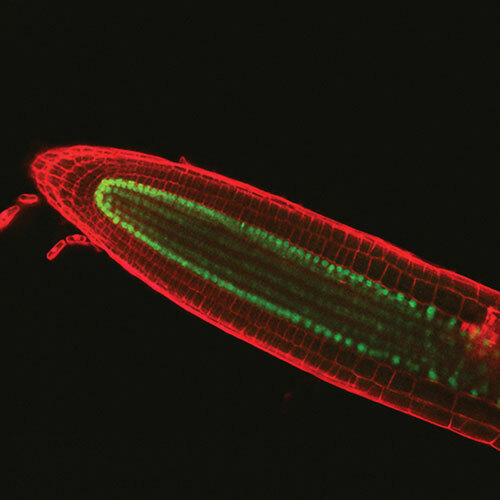 They were able to determine the cell-type-specific expression patterns of 12 genes that were selectively expressed in the phloem of their plant model. Cell sorting is one of the fastest and most accurate methods for isolating individual cells or a population of cells from a complex mixture from both eukaryotic and prokaryotic cells. Cell-sorting instruments typically sort cells expressing fluorescent proteins or labeled with specific markers. “Cell sorting can also be used to isolate single cells for subsequent single-cell qPCR or digital PCR studies,” says Melissa Ma, global product manager for the cell biology business unit at Bio-Rad Laboratories. Cell-sorting systems are usually located in core facilities at academic, government, and industrial research institutions not only because of their high cost ($250,000 to $1 million), but also their complexity, which requires the need for a dedicated operator. As more and more researchers are utilizing the power of cell sorting, core labs can sometimes experience a bottleneck, with investigators waiting for their turns at sorting. Because of these issues, companies are seeking to develop more affordable and easy-to-use units. 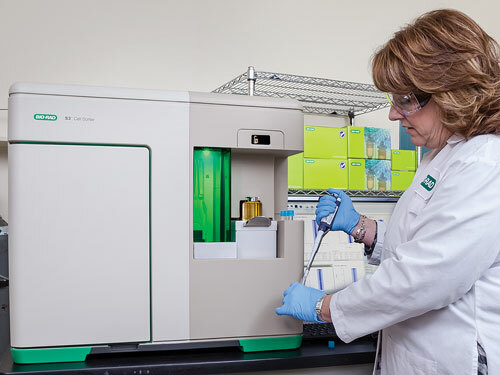 An example of this emerging trend is Bio-Rad’s S3™ cell-sorting system. Affordable and user-friendly systems will likely make cell-sorting instrumentation more accessible to a variety of new labs and core facilities that could not previously afford or support a cell sorter. To relieve cell-sorting processing bottlenecks, laboratories might consider more affordable, easy-to-use cell-sorting units. Bio-Rad asserts that its S3 flow cytometer is designed to make cell sorting more accessible.